Lee Priddy pops open a plastic container of blue ear plugs and holds it out like one would offer chewing gum. A sign in the live performance studio at Priddy Music Academy (PMA) recommends ear protection. Priddy is the owner of PMA, a school in Millersville where people of all ages can learn to play in a rock band. 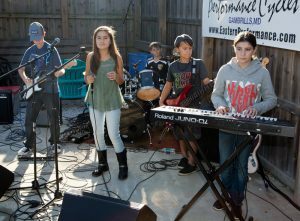 Go With The Flow, a rock band of four teenagers, three of whom are Priddy’s children, is setting up. 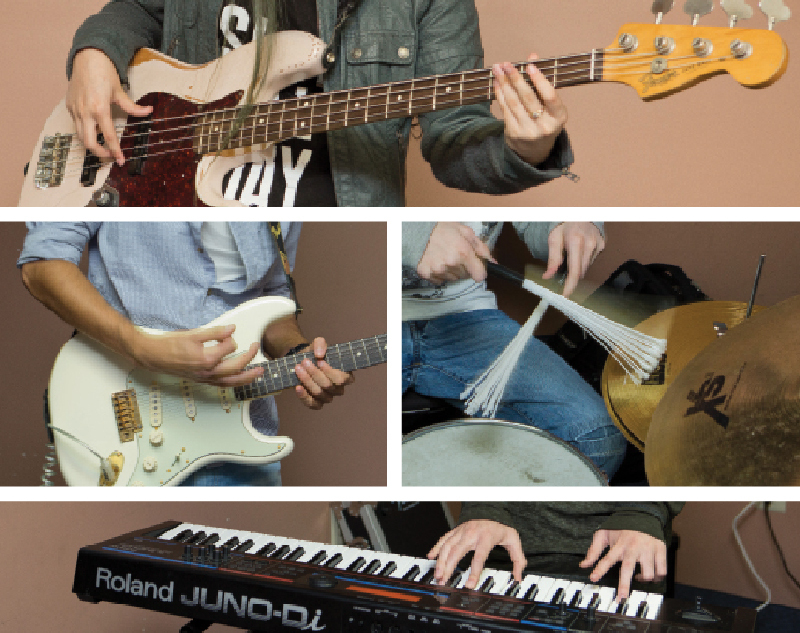 Lead guitarist and singer Max Pulone fastens the strap to the body of his new, cream-colored Fender electric that he bought with his own money. 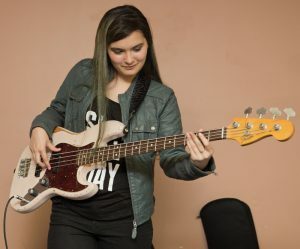 Priddy throws out a song suggestion: “Stevie Wonder?” Pulone offers his idol: “Maybe John Mayer?” “How about ‘The Spirit of Radio’?” asks Mackenzie Priddy, as she emulates Rush’s Geddy Lee on her bass. John and Andrew Lee stand ready at the keyboard and drums. They settle on Steely Dan’s “My Old School,” a song that showcases the technicality of each student. The well-known opening keyboard riff is played with confidence, especially for someone who has played the keyboard for only five years. The others chime in on cue. Drummer and bassist watch each other to keep the pulse tight. 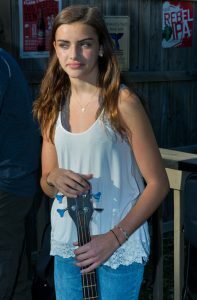 The singer croons, “I remember the 35 sweet goodbyes . . .” While none of the band members have been playing for more than five years, they execute the song with the precision of musicians many years their senior. The preparedness comes at Priddy’s confidence that his students can do it. He explains, “I have always wanted to have a music school, to nurture talent, and raise kids’ self esteem.” Trip Cahouet, one of Priddy’s former students and drummer for metal band Aura Awake, describes how Priddy encouraged him, at age 12, to play a Blink-182 song. Despite much self-doubt and after just a few weeks, Cahouet was nailing it. Priddy put Cahouet in a PMA band, mentored the group, and provided constructive criticism. “It was a great way to realize my confidence and explore a talent that I didn’t know I had,” says Cahouet. In addition to investing the last two decades teaching young musicians, Priddy is an accomplished musician in his own right. He began playing professionally at 15. He later joined a band, The Melons, penning several of their songs and touring all over the Southeast. The band dissipated, as bands do, but not before Priddy and the bassist were discovered by a legendary Alabama recording house. “Roger Hawkins of Muscle Shoals Sound Studio offered to produce my music,” reports Priddy. After much soul-searching, Priddy decided not to pursue that business relationship. 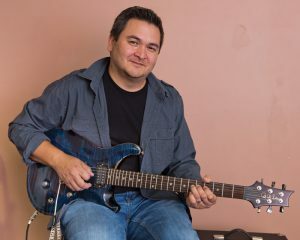 These days, he plays in Annapolis and the surrounding area with his band, The Lee Priddy Trio, and fills in with other groups. 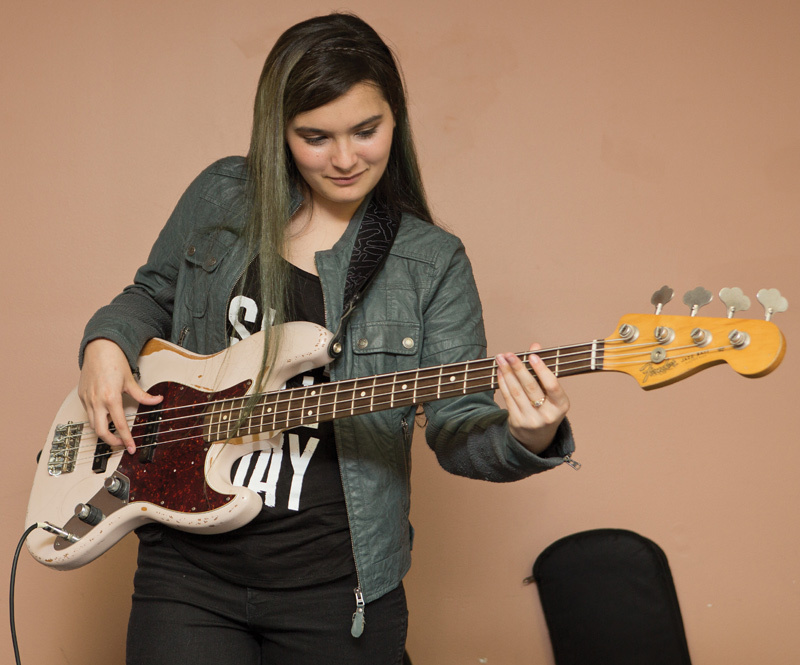 Back in the PMA live performance studio, Go With The Flow is playing Prince’s “Kiss.” While Mackenzie Priddy slaps her bass, Pulone focuses on the guitar lead. Act your age, mama, not your shoe size, maybe we could do the twirl. Error: Error validating access token: Session has expired on Saturday, 09-Mar-19 15:57:50 PST. The current time is Tuesday, 23-Apr-19 09:57:21 PDT.